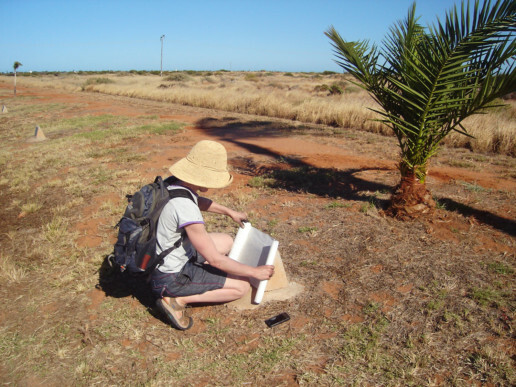 This work was made during a residency at Geraldton in November 2011 (organized through Fremantle Arts Centre and the City of Geraldton-Greenough). 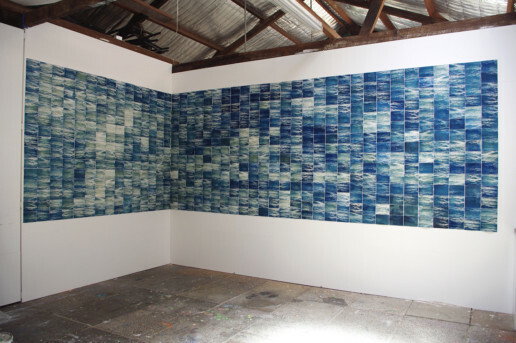 This work, made up of images I photographed over the site of the sea grave in 2007 and later transferred to paper, uses the Geraldton sun in a slow and meditative process involving cyanotype chemicals, the west coast location and a pacing between sunshine and darkness. 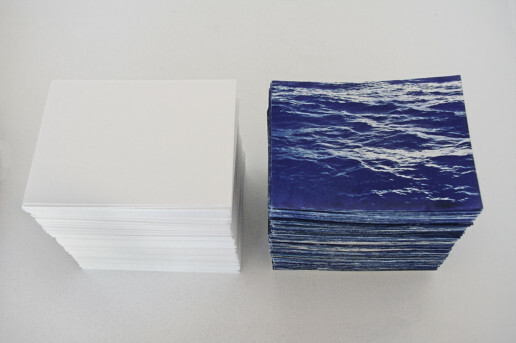 In focusing on the process and performance of print, the work seeks to engage with the ritual of grief and remembrance through the temporal and physical relationship among memory, making and place. 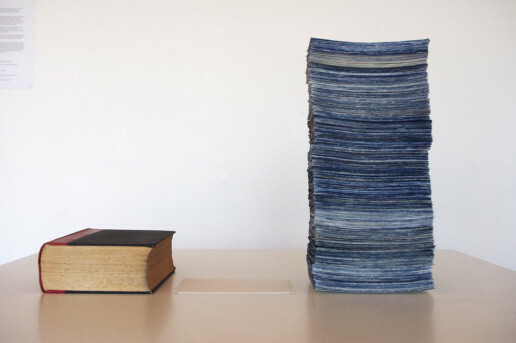 While the work was on exhibition at Fremantle Arts Centre in 2012, one of the 645 pieces was lost. 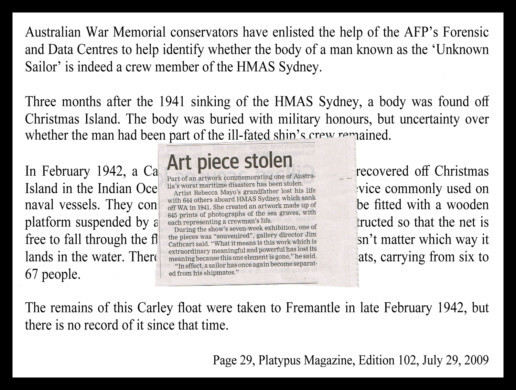 The postcard made to replace the missing piece connects the lost work with the true story of a Carley float beaching on Christmas Island months after the battle. Aboard that float was the body of a sailor whose identity remains unknown to this day. 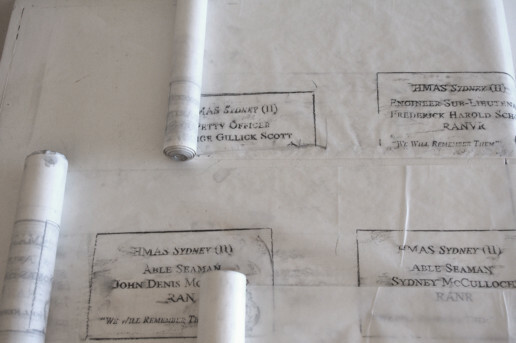 645 rubbings were made during a 2011 residency in Geraldton/Greenough, WA. Carnarvon is 500 km north of Geraldton. 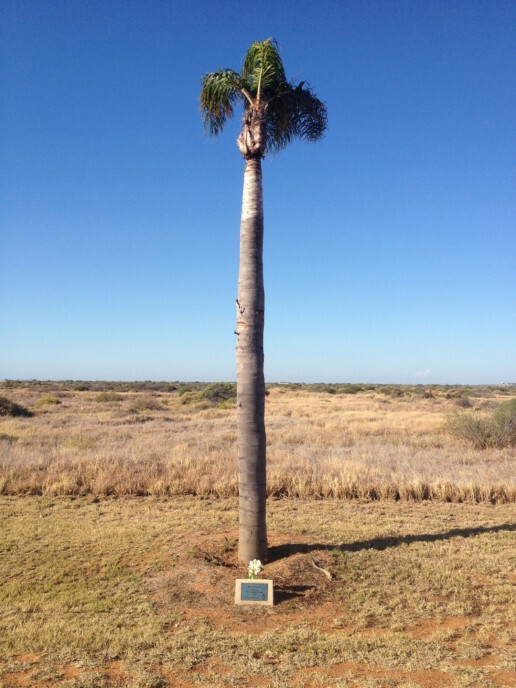 Driving into town, one passes along an avenue of honour, 645 trees planted in memory of the 645 sailors who died on board the HMAS Sydney II in 1942. 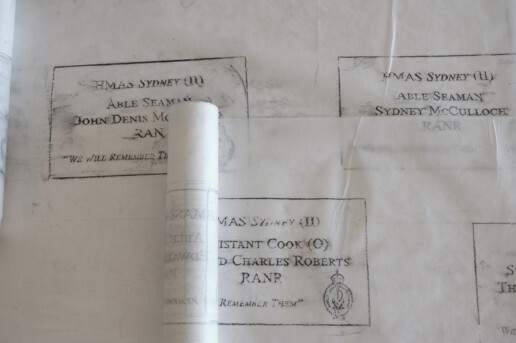 These rubbings are a companion piece to 645 hands. The landscape is flat with little growing above the horizon. Together, over two days, my dad and I walked up one side and back down the other. 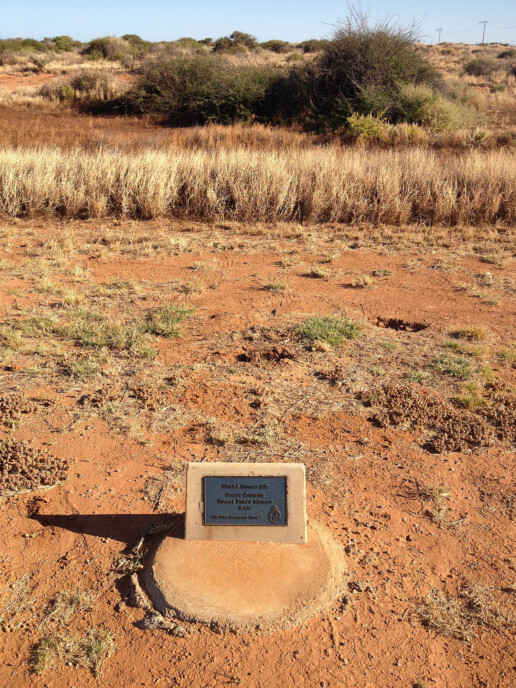 Walking from plaque to plaque—taking a graphite rubbing onto greaseproof paper from each—drew our attention to the ground beneath our feet, and to the tiny plants and animals living in this seemingly barren landscape. 16 hours, 2300 metres of greaseproof paper and 645 rubbings later, with sore legs from the repeated action of squatting and standing, we had performed a commemorative ritual of sorts. 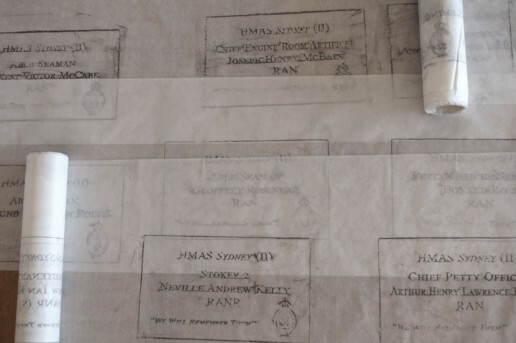 Not a celebration of war, and far from the tourist rubbings of famous people’s graves in Westminster Abbey, it was nevertheless a celebration of life—persisting amongst the plaques— and of loss. The residue, rolled back onto the cardboard tubes that housed the kitchen paper in the first place, fits inside a small box.